When I began to research books from 1968 for our club, I was actually surprised not only by the amount of books of interest from that year, but also by the number I had already read! I thought I would link to a few old reviews here, and also mention some I read pre-blog. I read this chunkster back in 2012, although admittedly this revised and uncensored version was not the same as that first published in 1968. Nevertheless, this powerful portrait of life under Soviet rule was a landmark book and I found myself unable to understand why Solzhenitsyn’s literary reputation isn’t higher in the West. A read from 2014, “The Quest for Christa T.” has a deserved reputation for being a difficult book. The writing is elliptical and elusive, but once you get into the flow and start reading it almost between the lines, it’s remarkably rewarding. Her prose is marvellous and I don’t know why I haven’t picked up any of the other books of hers lurking on my shelves. Latter-day Christie featuring an older Tommy and Tuppence Beresford (I love Tommy and Tuppence) and it was a wonderful romp with a very clever plot. As I said in my review, if I had infinite time I would read all of Christie’s books chronologically from start to end (and wallow in their wonderfulness). I’m rather sad that I’ve already read this, and fairly recently, because I’d love the excuse to read another Beverley. But then, who needs an excuse to read Beverley??? It’s quite a while since I read any of the wonderful novels by Elizabeth Taylor – and actually an annual readalong of the books by the lovely LibraryThing Virago group was actually one of the factors which impelled me into starting Rambling! And this was one of my favourite Taylors, a little darker than some of her other works. The Sculptor’s Daughter by Tove Jansson I’m a relatively recent convert to Tove Jansson, but I absolutely love her work, both for adults and children. “Sculptor’s Daughter” was her first book for adults, and it’s a beautifully written work which presumably blurs fact and fiction; it appears to be simply autobiographical, but I’m not so sure! Whichever it is, it’s lovely! I should confess up front that I’ve never really been one to plan ahead with my reading. I’ve always read on a whim, whatever my reading mojo feels it must read – and in fact if I feel I *should* read something it often puts me off. However, since starting to blog about books I have started to focus a little and plan my forthcoming reads a tiny bit – and I have often managed to stick to the plans! I greatly admire those who can decide what they’re going to read for the next month (or indeed the next 12 months) and then stay on track. 2. Heavenali and lots of other lovely LibraryThing VMC group members are having a Barbara Pym readalong for 2013 and so I shall be joining in and reading a Pym a month – as the books I have by Pym are on the TBR this will help with goal 1! 4. Heavenali is hosting a month of re-reading in January – which I think is an admirable thing to do because as she rightly points out, “That first experience of a book can’t be entirely re-created, but it can be enhanced.” I won’t commit completely to re-reading only, but I shall re-read as many titles as I can fit in alongside my new reading. 5. I have started to collect Anthony Powell’s “Dance to the Music of Time” sequence, aiming to get a set in lovely vintage orange Penguin. As there are 12 books, I’ve decided to commit to reading one a month. They are, after all, slim volumes and I think I should be able to manage this – and it is less intimidating than sitting down to read all 12 in one session! Happy Moscow – a new translation by Robert Chandler which is therefore a re-read (as I read the previous translation from the library) and a new read! After about ten days of joyous reading, I have actually finished the chunkster! And I must say that it has been a remarkably rewarding experience. This is one of the longest books I have read in a long while, and sinking myself into the depths of it, not rushing myself, becoming involved in the characters and their lives and fates, has been marvellous – and has also convinced me that I haven’t lost the knack of reading long works! “In The First Circle” has had a chequered history. On the back of the success of “One Day In The Life Of Ivan Denisovich”, which Solzhenitsyn had somehow managed to get published in the Soviet Union in 1962, the author decided to try to get more of his work out there. He knew that ITFC was unlikely to be published in its original format, so he edited it heavily, changing a number of plot details and removing whole chapters in the hope that the censors would pass it. They didn’t – but the truncated copy was smuggled to the West and published there in 1968 to great acclaim. 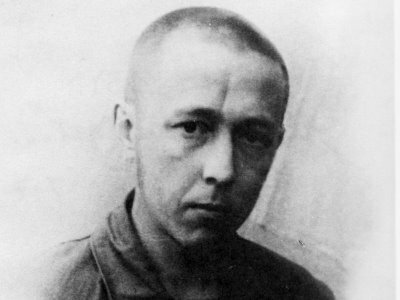 However, once Solzhenitsyn had defected to the West, he worked on reinstating the missing material and putting ITFC back into its original state. This 96 chapter version was finally published in English in 1999, translated by his approved linguist, Harry Willetts, and this is the volume I read. In the First Circle depicts the lives of the occupants of a sharashka (a R&D bureau made of gulag inmates) located in the Moscow suburbs. This novel is highly autobiographical. Many of the prisoners (zeks) are technicians or academics who have been arrested under Article 58 of the RSFSR Penal Code in Joseph Stalin’s purges following the Second World War. Unlike inhabitants of other gulag labour camps, the sharashka zeks were adequately fed and enjoy good working conditions; however if they found disfavour with the authorities, they could be instantly shipped to Siberia. The title is an allusion to Dante’s first circle of Hell in The Divine Comedy wherein the philosophers of Greece, and other non-Christians, live in a walled green garden. They are unable to enter Heaven, as they were born before Christ, but enjoy a small space of relative freedom in the heart of Hell. Innokenty Volodin, a diplomat, makes a telephone call he feels obligated to his conscience to make, even though he knows he risks arrest. His call was taped and the NKVD seek to identify who made the call. The sharashka prisoners work on technical projects to assist state security agencies and generally pander to Stalin’s increasing paranoia. While most are aware of how much better off they are than “regular” Gulag prisoners, some are also conscious of the overwhelming moral dilemma of working to aid a system that is the cause of so much suffering. Lev Rubin is tasked with identifying the voice in the recorded phone call, he examines printed spectrographs of the voice and compares them with recordings of Volodin and five other suspects. He narrows it down to Volodin and one other suspect, both of whom are arrested. By the end of the book, several zeks, including Gleb Nerzhin, the autobiographical hero, choose to stop cooperating, even though their choice means being sent to much deadlier camps. Volodin, initially crushed by the ordeal of his arrest, begins to find encouragement at the end of his first night in prison. However, a bare bones description of the plot gives no real hint of the richness and complexity of this novel. It’s remarkably well constructed and features a disparate cast of characters who are in fact connected by a complex web, which is gradually revealed as the book progresses. The story features a wide range of people, from the zeks, who are portrayed as having a relatively comfortable existence in the special prison, compared with those in Siberia; their wives and families, trying to scrape out an existence in the free world but often shunned because of their prisoner family members; the free employees of Marfino, who supervise the work of the zeks but in many cases become involved with them; the officers and the officials of the various state agencies who are often in conflict with each other while desperately hanging on to their positions; even the Great Leader, Stalin himself, is portrayed. Klara herself, who finds this love so unexpectedly, only to have it snatched away. Sologdin is another designer working on the various scientific projects, and apparently based on another friend of Solzhenitsyn. Innokenty Volodin, a diplomat, used to the good life and married to another daughter of the prosecutor. It is his actions at the start of the book that have such a dramatic effect on the rest of the characters. To say that the action takes place over 4 days is perhaps slightly misleading. Although the actions of the first chapter set in motion a train of events which will come to fruition over the following 96 hours, Solzhenitsyn does not restrict our understanding of the characters to only what we see happen to them during that period. Instead, he enriches our experience of them with the use of flashbacks and memories, each character recalling events from their lives and things that have brought them to this point in time. Some of these ‘back stories’ occur over several chapters, as in the sequence in which the Great Leader recalls his life and his rise to power. And each is illuminating and speaks with the individual voice of the character who is narrating it. The structure of the book is unusual in that the narration is described as “polyphonic”. Although in the third person, each chapter or sequence of chapters is told from the viewpoint of a different character. This enables us to get to know them all well and also creates a more intimate style of storytelling than that of an omniscient narrator but without the restrictions of a first person narrative. These shifting perspectives enable us to see events outside the sharashka and also allow us to appreciate different characters’ views of the same situation. The story is of course based on events in Solzhenitsyn’s life and men he knew. Like Gleb, he was imprisoned in a scientific research prison (Marfino) and we presume that the book is in fact a roman-a-clef. This is no criticism however – it would be a foolish author who claimed that his work was not influenced by his life, and if you have lived through remarkable experiences and times it makes sense to turn them into fiction, into a work that will outlive you and talk to future generations. And this book does talk to us – it paints a remarkable picture of what it was like to live under the Soviet regime: the fear; the impossibility of fighting back against a complex and iron-fisted bureaucracy; the distrust of fellow man; the mindless cruelty; the blind following of the cause. There is a magnificent chapter where many of the prison staff have to attend an educational talk on the Soviet state which is littered with meaningless sentences and statements which make no sense at all, which nevertheless they all have to pretend to agree with. One of the most moving sequences in the book is the chapter 61 when Innokenty visits his mother’s brother, Uncle Avenir, whom he barely knows and has not seen since her death. Despite this, and Ink’s initial doubts, the two men discover an instant family bond and are soon exchanging deep and treasonous opinions. Uncle Avenir is a secret memory man, retaining old newspapers back to the time of the revolution which show how the party line has changed and history has been re-written. His connection with his Uncle is one of the things which changes Innokenty irrevocably so that he goes on to take the momentous action of the first chapter. And irrevocable actions happen at several points during the book. Many of the characters make heartbreaking decisions which they know they will result in them being sent to Siberian camps and probable death, but they also know that they will be failing themselves morally if they do not make those decisions. Innokenty’s phone call, Gleb’s refusal to join a cryptography research group, Gerasimovich’s refusal to work on a project which will enable the Cheka to spy on other citizens, Ruska’s decision to put his status as an informer at risk by letting other zeks know who the informers are – these are all moral decisions with far-reaching consequences but which allow their makers to rise above their captors. …..Nerzhin saw the People differently. None of his books had prepared him for his new insight. “The People” did not mean all those who speak your language, nor yet the chosen few branded with the fiery mark of genius. Neither birth nor the labor of your hands nor the privileges of education admit you to membership of the People. Only your soul can do that. And each of fashions his soul himself, year in and year out. You must strive to temper and to cut and polish your soul so as to become a human being. And hence a humble component of your people. 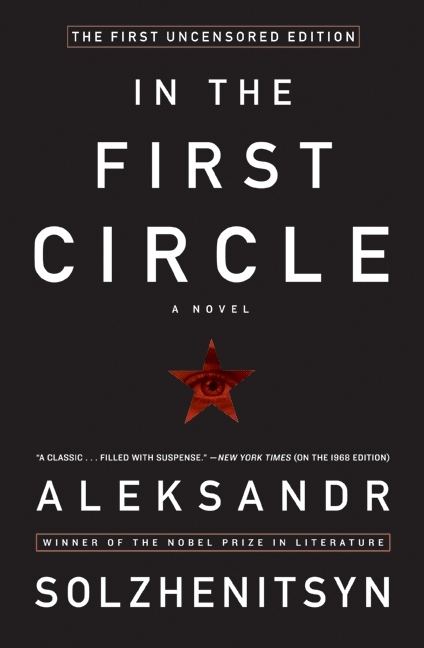 I should say here that I hadn’t actually read all of the truncated version “The First Circle”, only the first half-dozen or so chapters – but a quick comparison reveals how much more powerful the original, restored version is. The catalyst for action in the first chapter is watered down in the cut version from the passing of atomic secrets from the USA to Russia, to a warning to a doctor that he is about to be arrested. The impact is considerably lessened and it is hard to accept that Innokenty would risk his comfortable in the cut version, whereas it is entirely believable in the original, restored book. I find this book easy and a delight to read, but I do accept that it’s not for everyone and the fact that I’ve steeped myself in Russian culture and history helps! A basic knowledge of the history of the Russian Revolution and the Soviet years that followed it would be useful to any reader, but it isn’t essential – there is always the Internet to check up on an unclear reference! And on a practical level, there is a useful list of characters names and who they are at the front of the book. I find it astonishing that people have criticised Solzhenitsyn’s writing and claimed that he has only received attention because of the circumstances about which he is writing. This book is a remarkable piece of work – brilliantly written and constructed, populated with real, believable characters and painting a living picture of a group of human beings’ lives. I came out of the book feeling as if I had lived alongside the events in and around Marfino and I still have mental images of the action and the characters in my head. The novel addresses numerous philosophical themes, and through multiple narratives is a powerful argument both for a stoic integrity and humanism. Like other Solzhenitsyn works, the book illustrates the difficulty in maintaining dignity within a system designed to strip its inhabitants of it. My personal belief is that Solzhenitsyn’s reputation has suffered because of his refusal to embrace Western values. When he left Russia, the West (America in particular) seemed to want him to reject his cultural heritage and espouse Western views. But he never did this, pursuing his own beliefs and agenda to the end. Whether or not you agree with his views (and I don’t always) this doesn’t give you the right to condemn his writing with no grounds. His books are wonderful windows into a dark time, peopled with living characters and situations, and I highly recommend them to anyone who loves literature.